Week 5 is with the amazing Roz Stendahl! 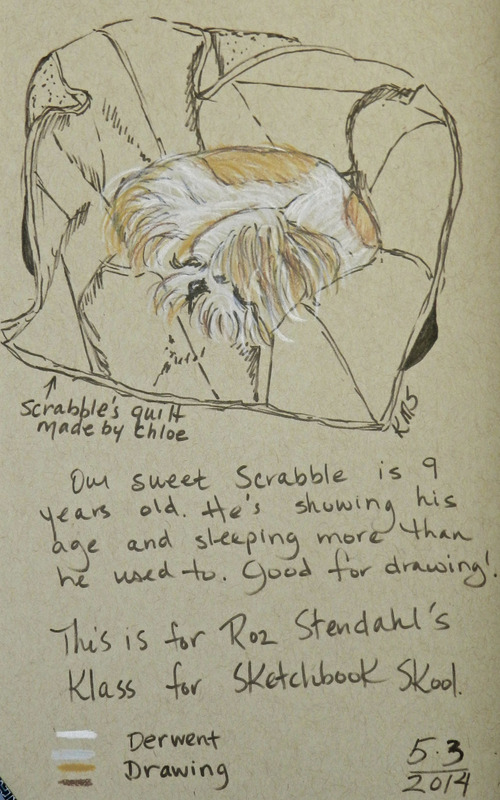 I have admired Roz's animal drawings for a while and her blog is a treasure trove of information. Her klass did not disappoint! She shared quite a bit of technical information as well as explaining her style and some methods of drawing animals. What fun! I was excited to get out and do these drawings while waiting for my husband's doctor appointment last Friday. These first two were drawn from live birds at a parking lot feeding station at the Wild Bird store. Talk about difficult! You definitely have to have patience when drawing birds. I was glad for the opportunities I had to draw the animals at the zoo a few weekends ago. Then, I picked animals that moved much slower. If you want to learn a lot about various art supplies and drawing, be sure to check out Roz's blog and allow yourself plenty of time! A sleepy Scrabble gave me the opportunity to practice on a very still pup. I rather like this one! I am loving this opportunity to draw from life. Roz also demonstrated drawing from animal models (stuffed specimens and realistic plastic toys). Ryan's got a bunch of animal toys I can play with. Should be fun!